Once again, Japan is raising the bar with hamburgers. This time, it’s turned its skills to Ghostbusters. Entabe reports that J.S. Burgers Cafe is rolling out Ghostbusters themed food at its restaurants. There’s the G.B. Burger (above), which comes with burgers slathered in black olive and anchovy paste, “bloody hot ketchup,” and cream on black buns. Yours for 1,580 yen or US$15.45. 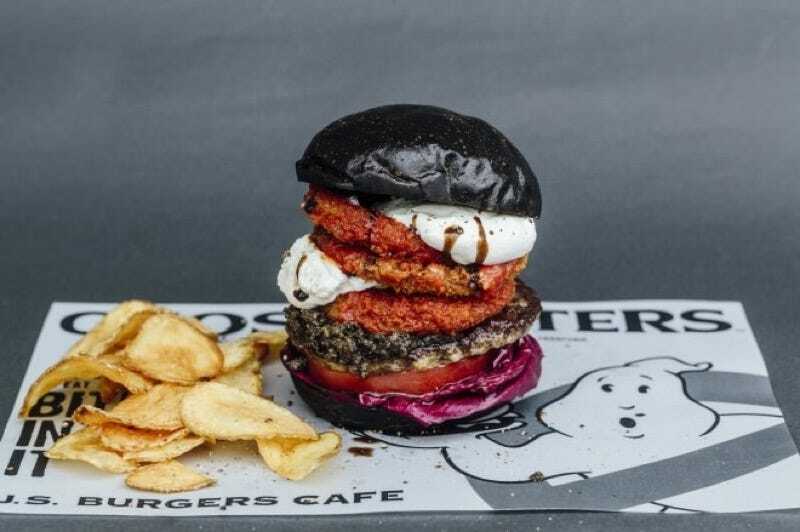 There’s also a Marshmallow Mad Burger for 1,280 yen ($12.52).Topped with a “blood berry” sauce, the burger’s white buns are stuffed with marshmallows, yogurt ice cream, and cookies. I ain’t afraid of no calories. Both burgers will be available from July 1 to September 30.